Yesterday went out to buy some components to make an interconnect for my old discman and CK²III. 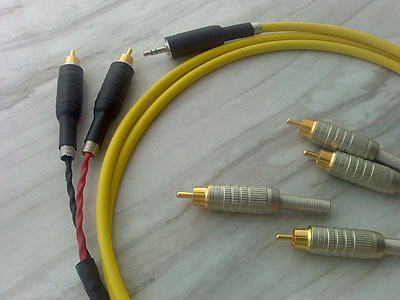 The cable is nothing fancy, at least not in the league of "audiophile grade". It is the Canare "star quad". Around HKD16 per meter. Although the price is not audiophile grade, but Canare "star quad" is famous in preventing hums and electro magnetic interference. It is commonly used in many studios and on stage. The "star quad" contains 2 twisted pairs and a braid shield. Of each twisted pair, one cable is blue and the other is white. 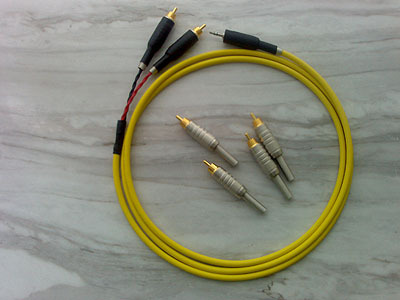 Commonly most people will use the colored (blue) cable to "carry" the left / right channel and connect the white cable to ground. But some people claim that due to dielectric etc reasons (@. @), using the white cable to "carry" the signal gives better sound... So that was what I have been doing in the past when I used the "start quad" cable. Since this interconnect is primarily for my discman and desktop headamp setup, one side is terminated with a Canare F12 3.5mm "headphone" plug, and the other side are 2 Canare F10 RCA plugs. Really like the Canare plugs, solid and heavy (brass inside!! ).